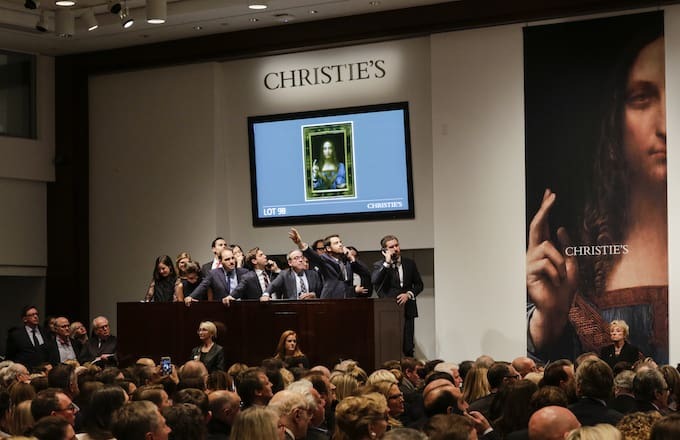 A long-lost Leonardo da Vinci oil painting sold for $450 million on Wednesday, smashing the world record for art sold at auction or privately. The piece—called "Salvator Mundi," Italian for "Savior of the World"—depicts Jesus Christ in Renaissance garb with one hand holding a crystal sphere and the other raised in blessing. Associated Press reports the 26-inch-tall painting was completed in the 1500s and is one of fewer than 20 known da Vinci paintings in existence. "Salvator Mundi" was commissioned by Louis XII of France and later owned by King Charles I of England. The artwork was presumed lost up until 1900, when it resurfaced and was acquired by a British collector; however, at that time, many people credited the work to one of da Vinci’s followers, Bernardino Luini.